September is the end of summer and although we're often lucky to have an Indian summer with blue skies and sunshine, nothing is certain with the weather. Whatever the weather brings, September is the month where the season begins to winds down. The bulk of the harvest comes home now and as crops come out the plot begins to empty. There's not a lot to sow but you can be getting hardy winter lettuces in along with spring onions. The most popular spring onion is White Lisbon and it is important to look for the words 'winter hardy' on the packet as ordinary White Lisbon will not go through a harsh period. Plant out your spring cabbage plants to be there for next year and that's about it except for over-wintering onion sets. These can be planted through September and into early October to provide a slightly earlier crop than spring planted sets or onion seed sown under glass in late winter. That doesn't mean there is nothing to do in the vegetable garden. Your hoe should be continuing to kill the weeds before they establish for starters. You need to be keeping a close eye on the greenhouse crops. The pests are still about enjoying the shelter and you need to watch out for fungal diseases if the weather is not so good and the vents are shut. Leaving the door open in the day to ensure a good airing will sort that. Tomatoes, peppers, aubergine and cucumbers will continue to need feeding, the rule being not to stop until the fruit has ceased to develop. Outdoor tomatoes and cucumbers will benefit from shelter unless the weather is exceptionally nice. With bush tomatoes, like plum Roma and San Marzano, the fruits will be ripening but this is attracting the pests. Anti-slug measures are vital, whether you use traps or pellets you need to keep them off. Once the potato crop is cleared, leave for a few days then fork over the top 20cm, which will reward you with potatoes that you will be amazed you missed when you harvested. 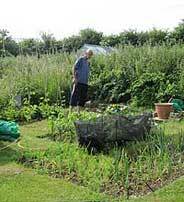 Break up the soil and level out before sowing a green manure like mustard. 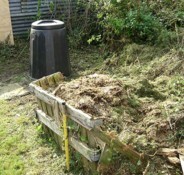 As land becomes vacant this is the time to sow green manures. If you have clubroot on the plot and can't sow mustard after your potatoes try Crimson Clover. It fixes nitrogen and is fast growing if not as prolific as mustard but is easy to dig in. You may well have reasonably sized parsnips now but they will stay perfectly happy in the ground until you are ready and they do taste better after they have had a frost or two on them. The runner beans and French beans will be continuing to produce and the last of the peas should be coming in. Compost the foliage of the peas but leave the roots in the ground as the nodules on them contain valuable nitrogen. The last of the onions should be drying now. Once harvested you need to ensure they have dried off to prevent rot in storage. They do best on a rack outdoors allowing air to blow through but you need to keep the rain off in some way without laying sheeting directly on them. Drying off in a greenhouse on slatted shelving can work but a sunny day raising the temperature results in half cooked onions that will definitely rot in store. Small leeks may well be ready to pull in September. Pull alternates from the row, allowing more space around those left to go through the winter.